From this point on I’m going to assume you’ve checked out Greg’s awesome tutorial videos and blog posts! I watching the videos several times before and during your staff creation process. He lists out all the needed supplies on his blog, but below I combined the lists in alphabetical order and detailed where I bought each item. 12”x12” leather I bought a single piece of leather from Amazon here, but I would recommend checking out your local Tandy Leather store instead. 12”x12” and 8”x8” pieces of 1/8” (3mm) Sintra plastic I had a hard time finding any cheap plain sintra plastic, so I ordered a blank white 24×24 piece from DisplayIt.com. I later found that you can also buy it from CosplaySupplies. Band saw Did not buy/use. 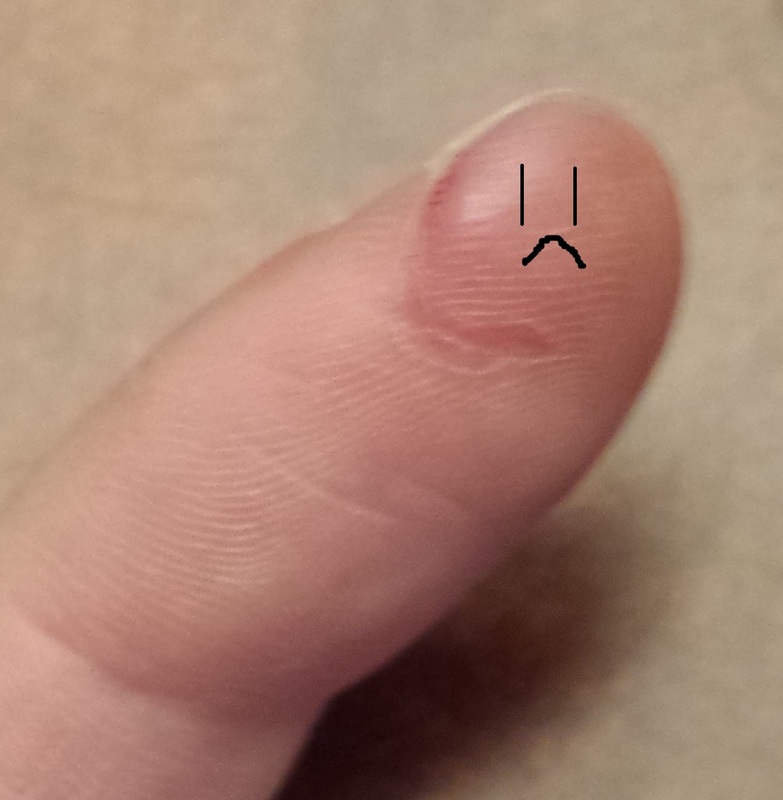 Instead used a dremel. Cyanoacrylate glue and kicker Glue on amazon; I did not buy/use a kicker. Evergreen styrene stock, various sizes I didn’t buy this — Instead I used some small thick plastic strips I had lying around. Perfectionists: Beware! 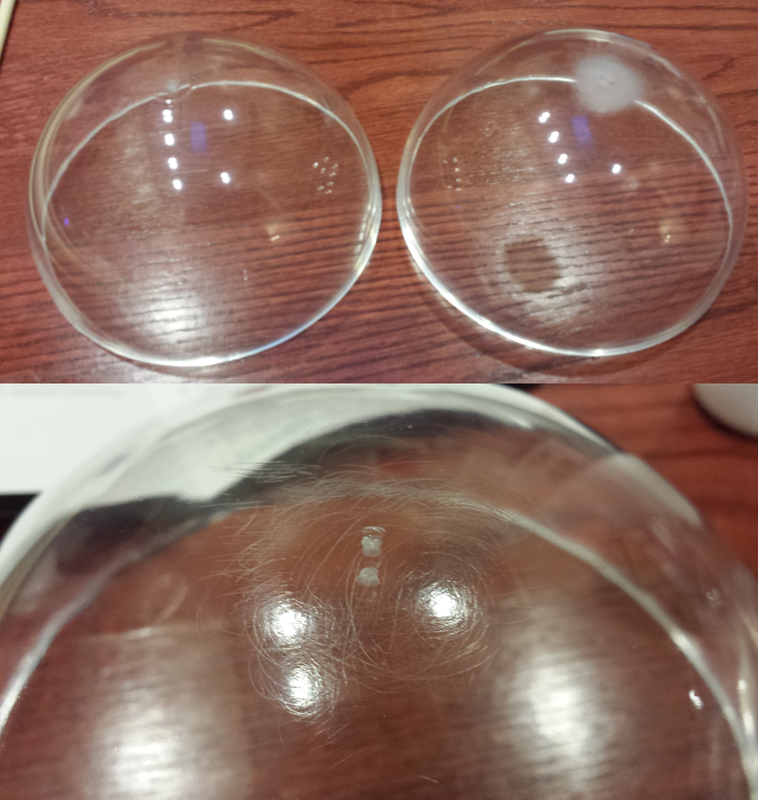 It takes forever to sand/polish the tops of the larger domes after you cut off the bumps. The more patience you have, the better it will look! These are the inner domes which go inside of the larger domes. The insides are spray painted. You can scrape off the extra paint on the edges with a file. Try not to use too much spray paint on the inside of the domes, else it will run. 6 pieces of the Sintra wings! 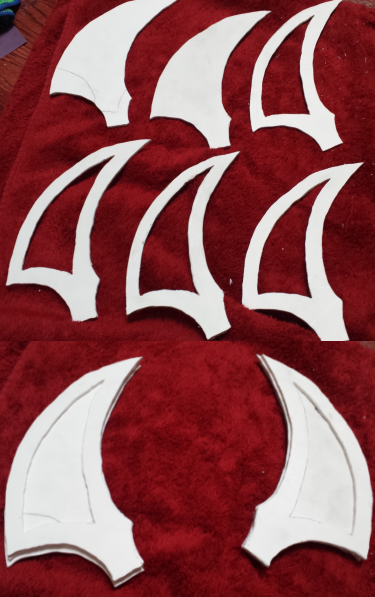 They’re not identical, but they’re sanded, assembled, and ready enough for epoxy. Here are the wings and rings after having all the edges epoxy sculpted and then after it dried overnight, and I sanded the excess epoxy and made it all smooth. This was one of my favorite parts of the project. I really like working with epoxy sculpt. Pro tip: Toilet paper holders do wonders for holding the rings while they dry! The ladder worked well for balancing the staff and holding the red orbs. I made a few extra ones, and I’m glad I did because most did not turn out so well! Such a huge mess! See “Resin pouring difficulties” and “Orb cleaning difficulties” below. With my completed staff at Gen Con! Consider portability: The finished staff is 5 ft, which is too big to fit in your luggage on a plane. I really wanted to cut the wood dowel and have it screw together so it would separate for travel. I used a drill press but could not get the two pieces to line up properly. 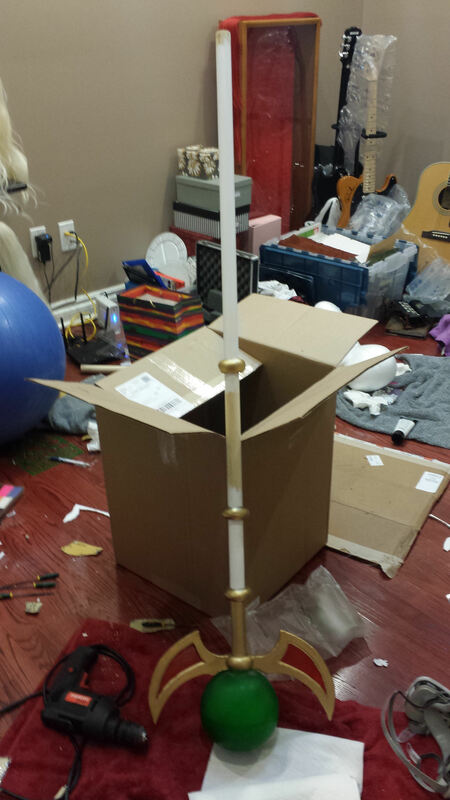 I gave up and just made the staff as a whole piece, but now I can only transport my staff when I’m driving to a convention. Instead, I would recommend trying to find a shop that will drill the pieces for you, and use a threaded insert or t-nut to attach them. 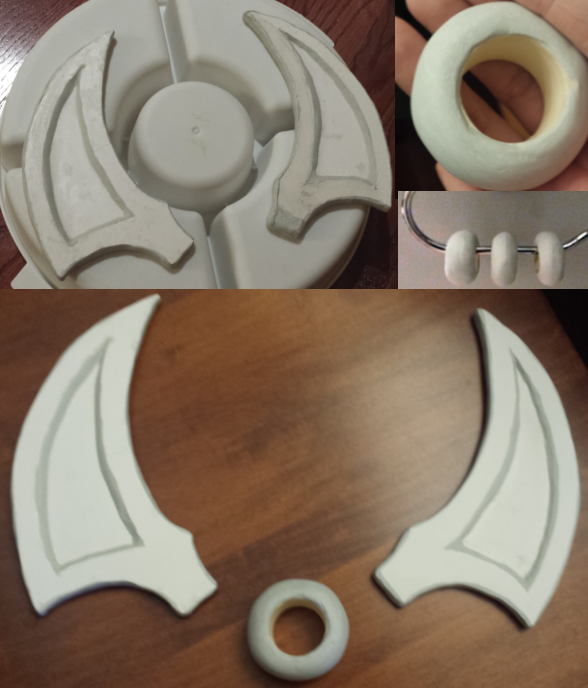 I’m making another staff for my RF Online Cora Warlock cosplay, so I will try this technique then! Resin chemistry: Be sure to get the ratio of resin to catalyst correct! I accidentally over catalyzed my resin, and the small red orbs didn’t turn out so well. Also, there is a bit of cracking at the top of my green orb. Resin pouring difficulties: In Greg’s video, he uses tape to create a kind of “bowl” around the base of the staff, and then pours the resin in the hole using a high pour. Felicia pours too much resin, and it creates a bit of a struggle, but the resin still stays within the tape and a crisis is avoided. 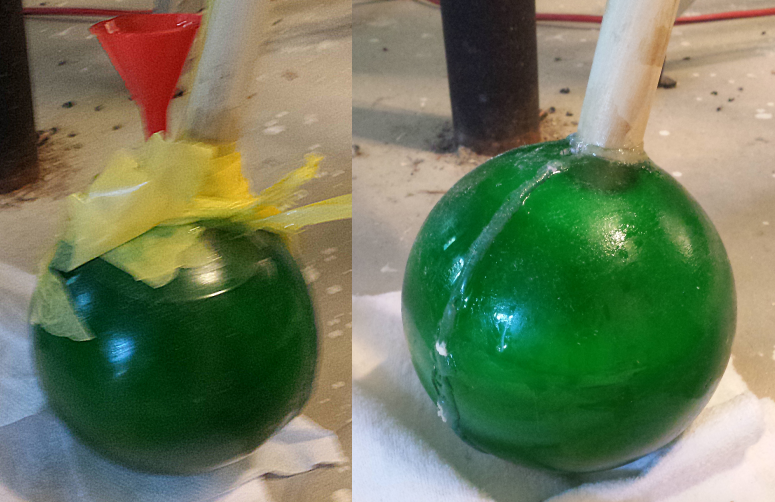 We tried just using the tape, and made a huge mess all over the orb. I then tried using a tiny funnel. The most important step here is to make sure your pour hole is big enough for the funnel you’re using before you start pouring resin… otherwise, you will have to use a dremel to make the pour hole bigger, and will get chunks of plastic mixed in with the resin in your orb. 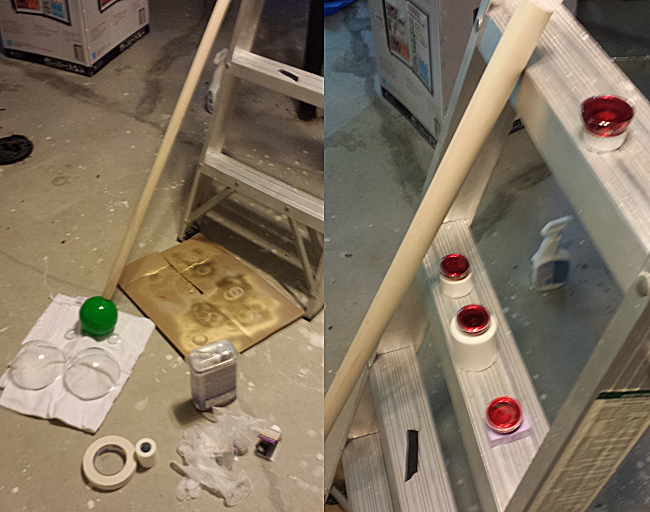 >_< Once the pour hole was big enough for the funnel it went pretty smoothly, just pour the resin slowly. It is very important to not use a plastic cup for your resin! Greg uses paper cups in his video, but I did not test paper cups. After the resin started pouring out of the plastic cup I tried to use, I just decided to destroy a glass from my kitchen and that worked well. Regardless, this part was such a horrible mess, haha. 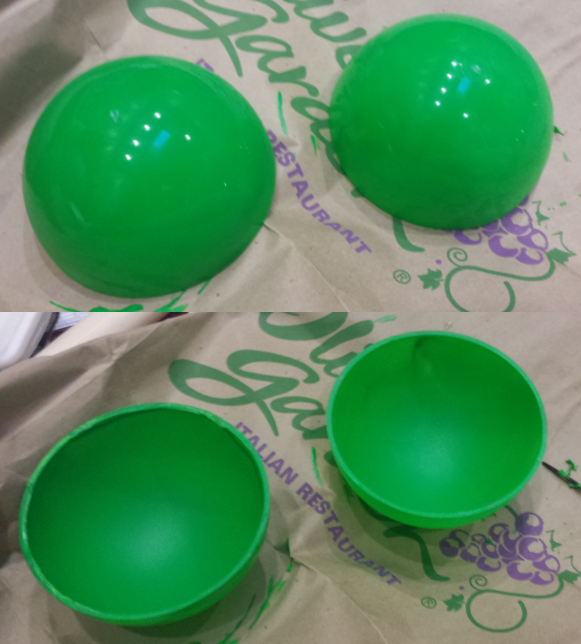 Orb cleaning difficulties: After the whole resin pouring mess ordeal, there was resin and goo all over the orb, plus the hot glue from the seam that had to come off. I would say this was the most depressing part of the project for me, because I sat on my basement floor for a very long time attempting various strategies to peel, scrape,and scrub all the goo off the orb; in the process, destroying all my fingernails, accidentally cutting myself with an exacto knife a few times, and having my head hurt from resin fumes even while wearing a respirator. T_T Yeah, it was not fun. I couldn’t really find an effective strategy for this part, besides realizing that I put too much hot glue on the seams, and the resin pouring was just way too messy. Twine gluing: In Greg’s tutorial, they superglue the twine to the leather just at the intersecting points. I did this initially, but it did not hold up for the first convention. I went back and glued additional parts of it. Try not to use too much glue though, because it will darken the leather. 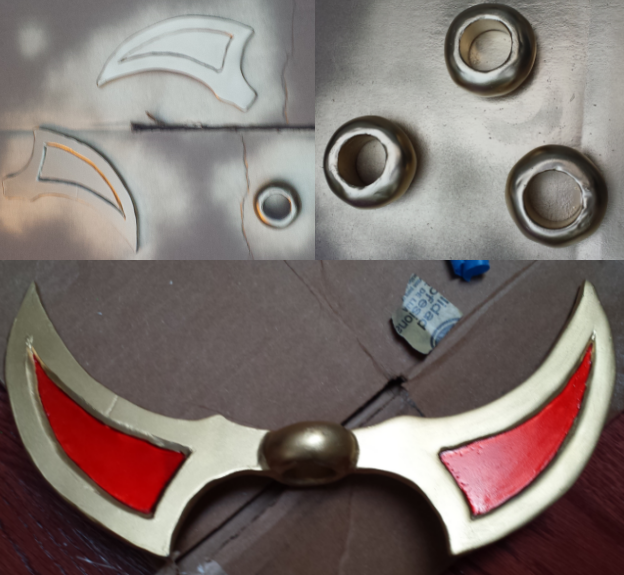 Sealing the paint: Consider using an acrylic paint sealer on all the painted parts individually before assembling them with the resin orbs. I used Mod Podge Clear Acrylic Sealer, but I only did 2 coats, and paint was still rubbing off after the first convention. I’m not quite sure if if the sealer or paint was the problem. But after that, I just touched up the paint and didn’t attempt to use any more sealers. Later I bought some Shellac and Liquitex sprays, and I haven’t experimented with them too much yet. My boyfriend and I after urgent care. Most importantly… love the flaws! You made something and now it’s yours, and it’s awesome. 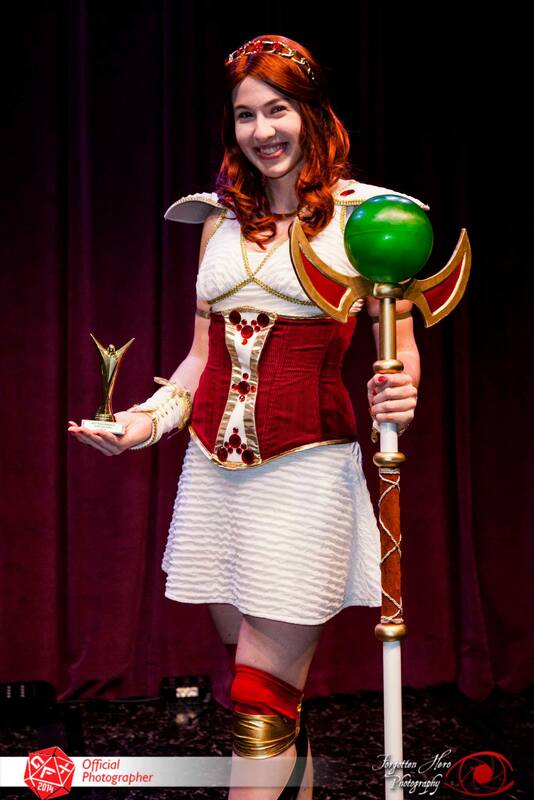 Even though my process of making the staff was not close to perfection, I still really love the way my staff turned out! My leg wraps are stuck on my legs with a ton of double-sided fashion/body tape. This is the only method I’ve had success with. It doesn’t look the best when sitting down, but it will stick on for most of the day if you use a lot of tape! My gold colored headband and necklace were bought on eBay, and then I glued red plastic gems onto them. The dress, wrist wraps, and knee wraps are store bought. I am planning on sewing new ones from scratch in the near future! I commissioned the corset from the lovely Fire Lily Cosplay!